The first law of thermodynamics is also known as the law of conservation of energy. When the quantity of something, like energy, does not change it is conserved. An energy balance equation is used to show where the energy is located within a system. From a creationist perspective, the first law of thermodynamics makes sense, since the Bible says that God completed His creation on day six. Therefore, it only changes; nothing new is created. And God, the Lawgiver of scientific laws, can easily make exceptions to His rules (i.e., perform miracles), as the Scriptures state He has done numerous times. The first law of thermodynamics is, unlike with creationists, a problem from an evolutionary perspective, since such a perspective needs the existence of energy to come into existence naturally; this perspective, unlike that of creationists, cannot rely on miracles. The proposed evolutionist solution is that there is negative energy in the universe that when combined with the positive energy of the universe adds up to zero energy; some claim that this negative energy is in gravitational potential energy. This concept, however, is seriously flawed. If the force is negative then the mass is pushed in a negative direction. The result is that the work is still positive. For work to be negative the force would have to push the mass in the opposite direction from which it is applied. r = distance between the center of each mass. 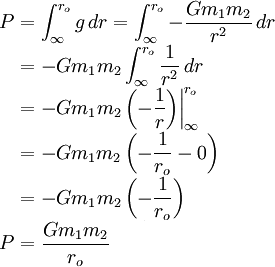 G = the gravitational constant. The potential energy (P) of a gravitational field is obtained by integrating the force of gravity over the distance from ∞ to ro. ro = radius of gravitating body. Since G, m1, m2 and ro are all positive, P is also positive. Since P = potential energy, the potential energy of a gravitational field is positive and not negative. This falsifies the idea that gravitational potential energy is negative energy. Work as been done on the effects of negative energy, showing that it would produce some effects that have not been observed in gravity. The final nail in the coffin of the notion that the total amount of energy in the universe is zero is that theoretically negative energy must be followed by a larger amount of positive energy so the positive energy must always be larger than negative energy. As a result the total energy of the universe must be > 0. This page was last modified on 17 October 2014, at 14:13.